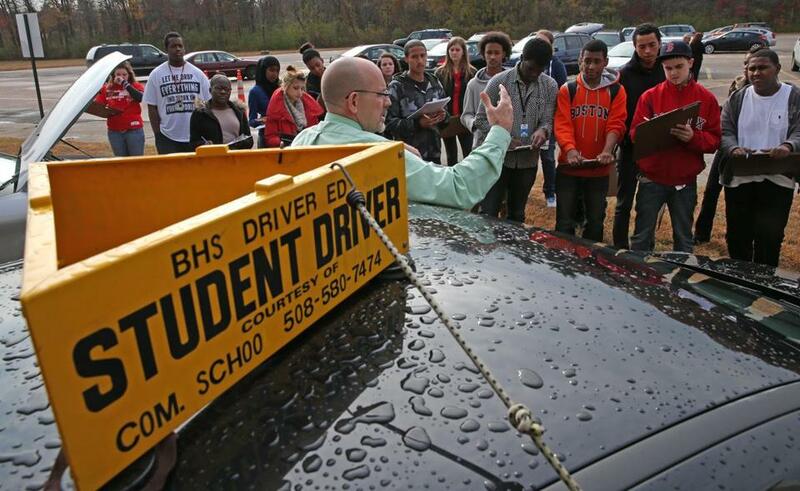 A driving instructor taught a class at Brockton High School. Tougher requirements passed in 2007 have discouraged teens from getting a license until they turn 18. The number of accidents involving newly licensed teenagers has dropped by half since Massachusetts raised the training requirements for young drivers and boosted penalties for teens who speed or commit other infractions. That good news gives transportation officials ample reason to crow about the law’s impact. But state data reviewed by the Globe suggest the biggest reason for the drop in crashes may come as a surprise: It is that fewer teens are on the road — not just that teens are driving more carefully. The number of 16- and 17-year-olds with a Massachusetts driver’s license has plunged by one-fourth since 2006, the year before the Legislature increased training requirements for drivers under 18, boosting the price and difficulty of driver’s education and persuading many teens to delay getting their licenses. “When they are not driving they are not going to crash,” said Anne T. McCartt, senior vice president for research at the Insurance Institute for Highway Safety, which has long supported increasing the minimum age to get a driver’s license to at least 17. For many teens already ambivalent about learning to drive, the increased cost and time of obtaining a license has persuaded many to delay what was once a traditional rite of passage for 16-year-olds. “This younger generation for whatever reason appears to be more willing to accept biking and public transportation as a mode of transportation,” said Michael A. Knodler Jr., a civil engineering professor at the University of Massachusetts Amherst who has studied driver safety. But in Massachusetts, most of the drop in young drivers occurred right after the law went into effect, giving teens who were anxious about driving another excuse to put it off. Abbey Morse, a 17-year-old high school student from Medford, waited five months after she turned 16 to get her learner’s permit and is not sure when she will get her license. She said she might wait until she turns 18, when she will no longer be legally required to take driver’s education and can learn with her family when she is ready. Some state transportation officials did not anticipate that the new law would prompt so many teens to put off getting their license, but said it was important to make sure drivers have training before getting behind the wheel. After all, Massachusetts already had tougher regulations for young drivers than many other states. American roads have also become safer in recent years because of safer cars, increased attention to drunken driving and other hazards, the high price of gas, and a weak economy, which has encouraged many motorists to drive fewer miles. As a result, accident rates have fallen nationwide for drivers of all ages, including those in Massachusetts. But the drop in accidents has been particularly stark among young drivers in Massachusetts — because there are fewer teens behind the wheel, and those who do get their license appear to be driving more carefully. Overall, 16- and 17-year-old drivers were involved in just more than 6,400 crashes reported to Massachusetts police last year, compared with 12,673 in 2006, according to preliminary figures from the state Department of Transportation. The number of the most serious accidents causing injuries or deaths has fallen even faster. Yet drivers under 18 remain nearly three times more likely to be involved in a crash than older drivers, though the gap has narrowed somewhat since the tougher licensing requirements and fines went into effect, according to a Globe analysis of state crash data. Specifically, the 2007 law more than tripled the number of hours teens must spend driving under their parents’ supervision to 40 hours, doubled the amount of hours needed with an instructor behind the wheel to 12 hours, and required parents to attend a two-hour seminar in order for drivers under 18 to get their license. The new requirements went into effect in September 2007. The increased requirements prompted many driving schools to double the price of a standard course from around $300 to roughly $600 to $700, according to local driving schools. And the training programs take longer, prompting some students to think twice before signing up for classes. In Waltham, Kaitlyn Brophy is 18 and does not have her learner’s permit. Brophy put off getting her permit two years ago when she narrowly failed the written exam, which had been lengthened from 20 to 25 questions in February 2009. But then Brophy figured she might as well wait until she turned 18, when she would not need to spend the money on a formal driver’s education course, to get a license. “It’s quite a bit of money,” Brophy said, adding that she was nervous about driving anyway. Brophy, who has since decided to take driver’s education anyway to save money on insurance, hopes to learn to drive during her winter or summer vacation. Some teens may also be putting off getting their license for other reasons, such as ready availability of mass transit, the high cost of gas, or high unemployment rates for teenagers, which means fewer need a car for work or have the money to buy one in the first place. The new law also increased the penalties for unsafe driving starting in March 2007, which may encourage those teens who get licensed to be more careful. For instance, speeding tickets call for a 90-day license suspension. But teenagers still get into serious crashes multiple times a day. There were more than 1,500 injury crashes reported in Massachusetts last year involving drivers 16 or 17 years old, including a dozen cases where someone was killed. For instance, a 16-year-old girl fatally struck a 13-year-old cyclist in Hopkinton in September. And an Easton high school football player killed a 71-year-old man walking his dog that same month. Dan Strollo, who runs a nonprofit that teaches drivers how to avoid crashes, argues teens should receive even more hands-on safety training to learn how to stop in an emergency and other safety skills since motor vehicle accidents are the leading cause of death for teens. Others say the driving age should be raised to 17 or even 18, because younger teenagers are less mature and more easily distracted. The Insurance Institute, for instance, has recommended raising the minimum age to receive a driver’s license to 17 nationwide, something only New Jersey has done. (It is 16.5 in Massachusetts.) In addition, the nonprofit recommends restrictions be placed on older teens. Massachusetts is one of eight states that require teens to wait until they are 16 to receive their learner’s permit, and one of 15 states to bar young drivers from driving other teens. Still, some other states have enacted tougher restrictions in some areas. Maine requires students to have 70 hours of practice behind the wheel, compared with 40 for Massachusetts. And South Carolina has restrictions on driving at night that start at 6 p.m., compared with 12:30 a.m. in Massachusetts under the 2007 law. And other states continue to beef up their rules. Just in the past two years, Iowa made teens wait longer to get their licenses after receiving a learner’s permit, and Texas increased the amount of supervised driving needed. Kaprielian, the Massachusetts registrar, would not say whether she thought the state should increase the driving age in Massachusetts or take other steps to make the law stricter. But she said she is happy that accidents have gone down since the rules were toughened six years ago. “This is proof positive that the  law is working,” she said. Todd Wallack can be reached at todd.wallack@globe.com. Follow him on Twitter @twallack.